Trojan Times often features a member associated with DSU that is considered exceptional to students, as well as other staff. This week Debi Collins has been chosen as “Staff Member of the Moment”. Students and professors will see this charming lady usually in the mornings and early afternoons bustling around in Myxers. 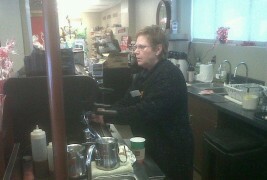 She’s the woman who prepares coffee and aids in waking half the school so that they are ready to start the day. Debi is certainly a woman to consider being friendly to, if no one wants a crunch in their coffee. A native to Madison, South Dakota, Debi was born and raised in this small town. Apparently she never left, but she still managed to get her degree in Fashion Merchandising and Management from Nettleton in Sioux Falls. She is married with four kids; two boys and two girls. However; the “light of her life” is her amazing granddaughter Jozelle who sees her almost every weekend because she, “can’t stand to be away from her.” Not only does her family keep her busy, but Debi also prides herself in having such a huge yard with many flower gardens and one “monster” garden that she tends to all year long. Living in a large old Victorian house also takes some time, but she enjoys decorating with her many antiques. So far, Debi has worked happily with DSU dining services for six years and helps quite a bit with the catering events and bartending at weddings and other functions. This heartfelt lady has done many events that involve volunteer, church work as well as working with the nursing homes occasionally. Family, friends and co-workers mean the world to this woman. Her boss Jen and her team Dawn, Zach, Jean, and Tina all help to make her life at DSU run smoothly. So, saying good-bye to people especially during graduation tends to break her heart. Respect for Debi Collins reaches farther than the simple love of her job, students, and co-workers. Diagnosed with Breast cancer in October of this year was an incredibly heartbreaking shock. However, Debi did not give in without a fight and she worked harder than ever by living her life and continuing to do the things she loved. On December 1st Debi had surgery. It was not only a long and painful process, but she also had to leave the school early. Students showed their support by signing cards and proving to Debi that they were thinking and praying for her. Debi Collins is back in business this semester and she is in high spirits even if she may have sprained her ankle during one of her days at work as well as the many doctor appointments she continues to attend. So, take some time in between classes to drop her a visit; she’ll make you quite a delicious drink!